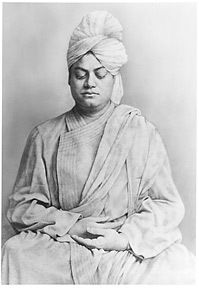 National Youth Day is celebrated on 12 January being the birthday of Swami Vivekananda. In 1984 the Government of India declared this day as National Youth Day and since from 1985 the event is celebrated in India every year. The National Youth Day is observed all over India at schools and colleges, with processions, speeches, music, youth conventions, seminars, Yogasanas, presentations, competitions in essay-writing, recitations and sports on 12 January every year. Swami Vivekananda's lectures and writings, deriving their inspiration from Indian spiritual tradition and the broad outlook of his Master Sri Ramakrishna Paramahansa. These were the source of inspiration and have motivated numerous youth organizations, study circles and service projects involving the youth. ^ "National Youth Day". National Youth Day 12th January. Retrieved 6 October 2011. ^ "PM's address at the Inauguration of four Year Long Celebrations of Swami Vivekananda's 150th Birth Anniversary". Indian Government. Archived from the original on 16 August 2012. Retrieved 1 June 2013. ^ "National Youth Day, India" (PDF). National Youth Day. 12 January 2009. Retrieved 6 October 2011.